How Would Your Day Change if You Were a Missionary? Home Pastors Articles for Pastors How Would Your Day Change if You Were a Missionary? I had a great visit with a church member recently. In our discussion, he hit on a point that I believe many Christians have a burden for. Essentially, he was concerned with intentionally integrating Christ in all that he does, in particular his work environment. In one sense, I as a pastor want to tell people exactly what to do, and in another sense, I do not. On the other hand, I don’t want to tell him what to do. Instead, I want to ask him what to do. What would change if you did your current job as a missionary to Europe? What changes would you make if you had been sent to a foreign country, given a job, a house, and the mandate to be a missionary and reach those people? How would you spend your time? How would you pray? What types of relationships would you pursue? How would your read the news? What would you think of your neighbors? How would you talk to the cashiers? What would you be listening for in your community? As Christians, we often need a reorientation in our thinking back to our basic identity and calling. “What if you were a missionary…” is not a hypothetical question. 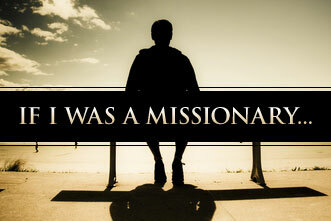 We are missionaries sent by a missionary God. This reality must give shape to our thinking, planning, and action. I love that my friend is asking and thinking about these things. Erik is a pastor at Emmaus Bible Church (EmmausBibleChurch.org), a church plant south of Omaha. Converse with Erik on Twitter at @erikraymond.